One of those college campuses was Ivy League. Rhonda Fink-Whitman, the daughter of a Holocaust survivor, the subject of Fink-Whitman’s novel, 94 Maidens, has been crusading to change the state of ignorant, so prevalent in American youth about the Holocaust, World War Two, and genocide. Five states have made Holocaust studies a mandatory part of the public school curriculum: California, Florida, Illinois, New York, and New Jersey. Fink-Whitman wants to see Pennsylvania, her native state, follow suit. To that end, Fink-Whitman went out to several college campuses, Drexel University, Temple University, Pennsylvania State University, and the University of Pennsylvania, and à la Jay Leno’s Jaywalking routine, stopped students at random to quiz them, catching it all on camera. Now these are not dumb kids. They just were never taught about the subject, so how can they be expected to know anything about it? And that is precisely Rhonda Fink-Whitman’s point. She wants mandatory Holocaust education in Pennsylvania schools. Fink-Whitman proves that students educated in states where such education was mandated, have an excellent grasp of the subject, whereas, the Pennsylvania students were shockingly ignorant of this important (and recent!) period in history. Watch Rhonda Fink-Whitman’s clip and judge for yourself. Were these students cheated? Shouldn’t they know more by the time they get to college? We think Fink-Whitman presents a compelling case for mandating Holocaust study in American public schools. On the other hand, the Holocaust is not an easy subject to teach. No one has yet lit of the perfect formula for imparting such information to young minds. The gravity and to be frank, the horror of the subject, seem to be, like X-rated movies, unfit for children. There does seem to be a consensus, however, that the study of the Holocaust should begin early, rather than be taught all at once. Let the lesson be learned gradually, according to the age of the child and his understanding. We thought we’d offer some extra materials on the subject here at EDU Review today, to help parents help pad out what their children know about this difficult subject, that should be a crucial component of the general education of any well-rounded person. One good way to bring the lesson home is through something familiar that connects the experience to the student in a tangible way. Here is where a little-known fact comes in: Theodore Seuss Geisel, also known to millions of children as their beloved Dr. Seuss, served as chief editorial cartoonist for the New York newspaper PM from 1941-1943. Incensed by the news coming out of Europe, he tried to raise awareness of the Holocaust among Americans through his work. While at PM, he created over 400 political cartoons. Read more HERE. At least one of Geisel’s later characters from his popular children’s stories, was based on a figure from that terrible time. Yertle the Turtle, said Geisel, was meant to symbolize Adolf Hitler and the story in which Yertle is featured is a cautionary tale about fascism. HERE is the story behind Geisel’s work as a political cartoonist and how he tried to wake up America to goings on in Europe during that tragic time frame. Want to see more of Geisel’s political cartoons? 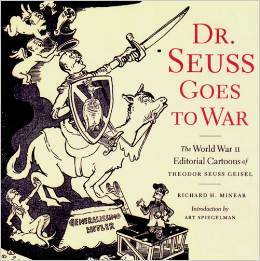 Richard H. Minear has created a collection of the cartoons in his book, Dr. Seuss Goes to War: The World War Two Editorial Cartoons of Theodore Seuss Geisel. You can peek inside the book on Amazon, HERE. Should your child wish to have a broader knowledge of the Holocaust, one good way to offer some perspective is to show film clips offering various perspectives on the subject. There’s an excellent documentary about the children of Nazi leaders and how their parents’ work affected their lives, but you may wish to view it on your own, to decide if it is appropriate for your child’s viewing. Here is another interesting perspective: that of Dr. Bernd Wollschlaeger, the son of a decorated Nazi tank commander. In this clip, Wollschlaeger tells the story of growing up in the shadow of his father, his subsequent conversion to Judaism, and his eventual emigration to Israel, where he served in the Israel Defense Forces (IDF) as a Medical Officer. To hear and see more survivor testimonies, go to the IWitness USC Shoah Foundation web page, HERE. It is possible your child will be disturbed by the knowledge of the Holocaust and this is to be expected. Hug your child and be understanding. There is not much else to do. The Holocaust is a grim subject, to be sure, but a critical period of history that must be learned if we are to make the Holocaust catch-phrase, “Never Again,” ring true. And as Rhonda Fink-Whitman’s clip tells us, if you won’t make Holocaust education mandatory for the sake of the survivors, do it for the children. Editor’s note: This post was originally published May 1, 2014, and has been completely revised and updated for accuracy and scope.